Moroku wants all kids to build a healthy relationship with and beliefs around money. We want to do this because we have a sense that money is a major way that we measure success and whilst it doesn’t create happiness there is no doubt that it is involved in many of life’s central missions: owning a home, feeding our families, going on holidays and so on. None of these things occur overnight. Rather they are the result of daily discipline. It’s not the things you do when the coach or fitness instructor is around that make the difference. Its all the other little decisions you make every day, on your own, that become the beliefs you have and habits that you create that will determine the outcome. Many of the beliefs we have are created very early on. Beliefs are often so young and deep in us, that many of us don’t know where they come from or indeed that we have them at all. Finding, unpacking and then reprogramming beliefs can be very difficult as we grow older and is where the adage “that you can’t teach an old dog new tricks” stems from. This is very relevant with beliefs around money. Many money patterns get laid down very early and can become defining. If we were taught in Sunday school that its easier for a camel to pass through the eye of a needle than for a rich man to enter the kingdom of god, we may have packed that belief away in a nice dark corner of our subsystem, ready to sabotage any attempts we might make to acquire wealth. Many of these beliefs become more complex in a digital world. Research indicates that as we digitise money we disassociate from it. Gone are the days when Mum and Dad would come home on a Friday night and divide up the pay packet. If you’re lucky, or unlucky enough depending on your view, money seems to just endlessly flow from the bank of mum and dad. As we go cashless, money becomes less tangible as it we postpone paying for stuff with credit that sits in our Spotify or Amazon bank account. 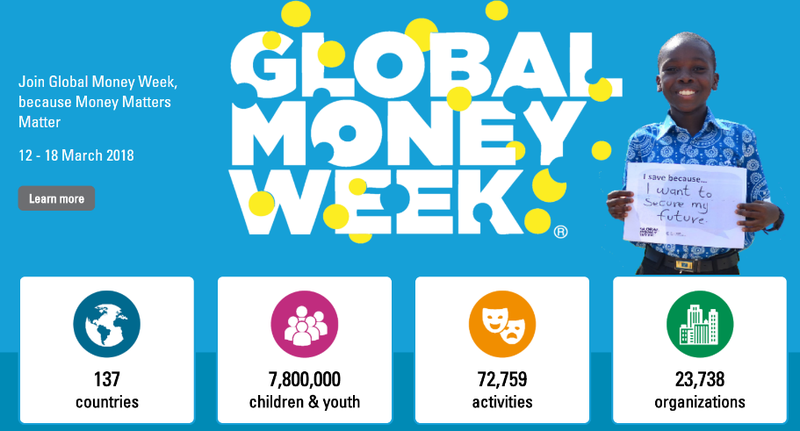 Its for these reasons that Global Money Week in partnership with the OECD this past week has “Learn, Save, Earn” as their core theme in recognition that it is important for children and youth to build clever savings habits from an early age in order to cultivate key money management skills for later in life. It is particularly important to create healthy beliefs, relationships and muscle around money early, leading us to create Chore Scout; a children’s mobile banking app. So that’s the Why. What about the how? Readers of this blog will know that Moroku’s research has uncovered 2 critical levers. If these levers aren’t in place, child financial literacy programs are less likely to succeed. When implemented inside of a digital banking strategy they not only have the power to build financial skills for life but also an incredible viral marketing opportunity – Win Win Win. Science indicates that fun and play may function as an important, if not crucial, mode for learning. Indeed there is a whole institute “The National Institute of Play” organised around harnessing the power of play to create transformational differences in their individual, family, school and organizational lives. Intuitively we al know this. Its why the entire animal kingdom uses fun to teach fundamental life skills and why people get really good very quickly at Candy Crush and Clash of Clans. We rarely succeed in anything unless we’re having fun. This is in part because we so often measure success in terms of how much fun we are having. It’s a given – We need to have fun in the mix if we are to win. Being great with your money is hard work. It requires sacrifice and discipline, yet we are very poorly wired to sacrifice and be disciplined. Its why we procrastinate, goof off, go shopping when we should be spending, have vices and spend too much time on Facebook. If we are going to get customers to sacrifice and be disciplined, we must do more than just show them where they are and where they are going with their money like most of the banking products do today. We must make the tough stuff fun and rewarding or our customers will follow the path of least resistance and go find things that are fun and rewarding. The second element that has a huge influence on learning success is social. We do not exist as separate beings and this is even more true in children and particularly the children for whom we are trying to give financial skills to. Maslow, Freud and an enormous range of philosophers and sociologists all agree this point. Its how we thrive and how the development of our mammalian brain that is built to allow us to build relationships, separates us mammals from reptiles. There is naturally a very different experience to a video being listened to or read versus and experience that a child has with their mum, dad or guardian. It makes a lot of sense that when the people who the children love and respect are engaged in the task so too will they. At play here (pun fully intended) is also the social nature of money. Once we get past childhood, money is rarely our own as we engage in relationships or various forms and go about getting educated, going on holidays and owning homes together. In all of these pursuits money is often the glue that brings us togetehr around these projects: Our education, holiday, car, home, retirement, wealth etc. Within child financial literacy this becomes very interesting. Its not only mum and dad that have an interest in their child’s financial literacy, work around the home, progress at school and sports, goals and aspirations. Aunts, uncles, grandparents and cousins are all concerned because of the point made earlier around us being social beings. If we can build platforms that not only engage parents and children around their money but also the rest of the family, there is enormous leverage for the children and a massive viral marketing opportunity for the provider.